Taking technology to newer heights. Make your ideas into applications by cross platform with consistent user experience. Strategies focused on increasing the reach and visibility of your business. We craft unique & new digital experience layouts! We are a focused, ideas driven design agency here to help you grow your brand and business online! Yes! Our templates for desktop, tablet and mobile layout versions. Grab a slice of the future with one of our competitive smartphone application for all operating system. Increase online sales, drive highly targeted traffic to your website. Develops your applications with the exact precise expectation you want. Our powerful & flexible e-commerce solution will help you achieve continued online success. Expertise in building right programs with the right approach the first time. 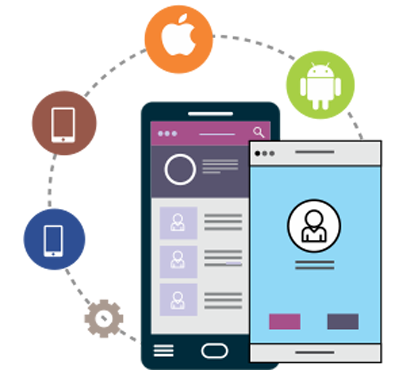 Mindrops (Formerly Advait solutions) is one of the fastest growing and most promising Web and Mobile application development company. A complete gamut of internet technology services and a complete process driven approach makes Mindrops one of the best technology partner for you. You get the right business consultant, the most fittest technical developers, eagle eyed Quality Assurance professionals and highly qualified Project Managers. Our objective at Mindrops is to empower our clients on their digital journey by applying our in-depth market knowledge and portfolio of IT services. Thanks for the excellent job you have done on our website. I am very pleased with the final product. I’m so glad I selected Mindrops (Formerly Advait solutions). You made it a pleasure to work with you from the initial conversation of the concept of my website, through content development and page layout to the final roll out of the site. The part I enjoyed best was your professionalism and your ability to get things turned around in a timely fashion. I have been pleased to continue to use your services to monitor and tweak my website to make it indeed a valuable asset for my business. I am very pleased with the re-design of my website by Mindrops (Formerly Advait solutions). It has been several years now that I did not feel connected with my previous website - it was cold and looked typical of other realty companies which is what you get when you use a template-type website design. However, Mindrops consulted with me and helped me identify a design that is personalized, warm and easy to browse. Thus far, my past clients who have visited the website like the look & feel of it, and so do I. I would highly recommend Premier Web Design Solutions to any business/individual for their Internet marketing needs.